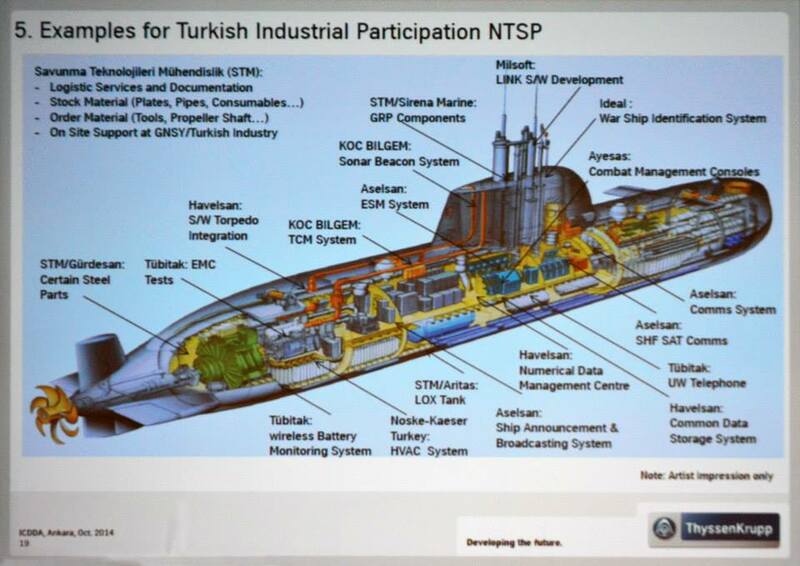 During the IDEF 2015 12th International Defense Industry Fair, Turkish Navy shared the first conceptual drawing of the second generation of Milgem class. There was a poster about TCG Istanbul on the Turkish Naval Forces booth during IDEF 2017 too. 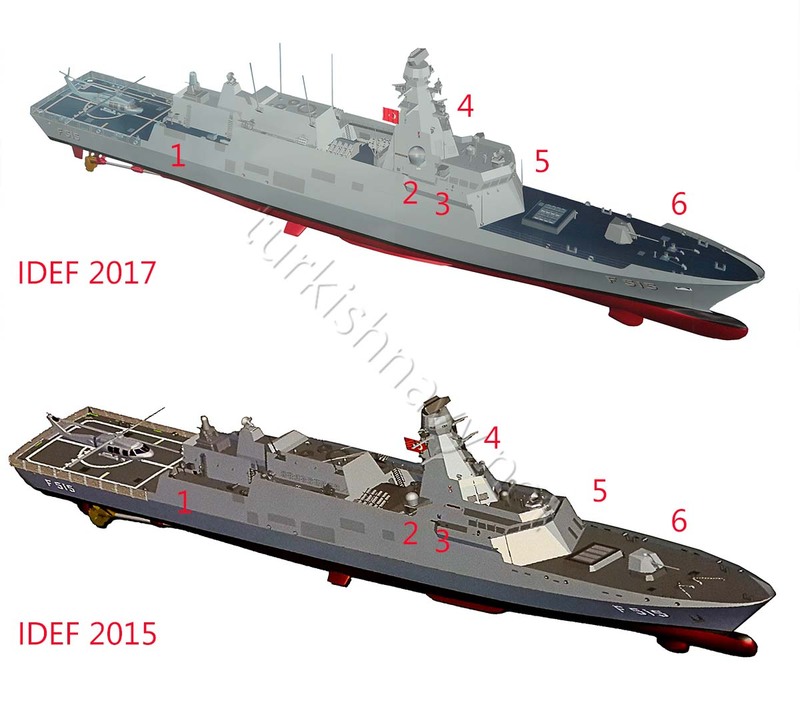 I though it would be interesting to compare the photos and see how the design of TCG Istanbul has evolved. Not surprisingly there are a few changes in design on the outside. Any changes made inside the ship remains elusive. The changes are focused between the bow and midships. It seems as the design of the ship from midships to aft has been found satisfactory. 1. If the darker patches along the hull indicate openable hatches, there is a new hatch at location 1. On Ada class corvettes this area is used for replenishment. Since the design of TCG İstanbul is based on Ada class it is safe to assume that this area will be used for replenishment too. Thus there was a need to implement a hatch there to ease the operations there. 2. The location of the SATCOM antennas has changed. In 2015 there were located towards to the end of the mast. In 2017 there were moved a few meters to the front. 3. There are new antennas there. Their place and shape suggests antennas for an on board electronic warfare system. Probable a local development. The antennas of SATCOM and ECM are pretty close. I hope they won’t create any interference. 4. The photos are not quite detailed but the electro-optical tracking and detection system has changed. In 2015 it was round and ball-shaped like ASELFLIR 300D. In 2017 it has a distinct rectangular shape of Denizgözü-Ahtapot. So the old system used on Ada class corvettes and Tuzla class patrol boats was replaced with a new generation sensor. 5. The shape of the bridge, and the forward part of the mast has changed. In 2015 the forward surfaces had a more slanted slope. In 2017 the slopes are more steep. The roof of the bridge is also less clustered and has more clean lines. 6. The all closed bow guards rails has been modified. The newer version has a bow bulwark and open guard rails. This must have changed the stealthiness of the ship. But the trade-off between becoming a little less stealth and having a flexible forward maneuvering area must be important for the handlers. The sensors with the exception of the EO system and addition of ECM system and the weapons seem to be unchanged. Mr. Hakan Kılıç, military aviation and ballistics missiles and BMD researcher, visited the newest warship of Turkish Navy: TCG Bayraktar. He took photos during his visit and kindly allowed me to used them. The photos you are about to see are his, but comments are mine. The stern of TCG Bayraktar. The stern door leads directly to the vehicle bay that covers the whole length of the ship in a true Ro-Ro style. The vehicle bay. 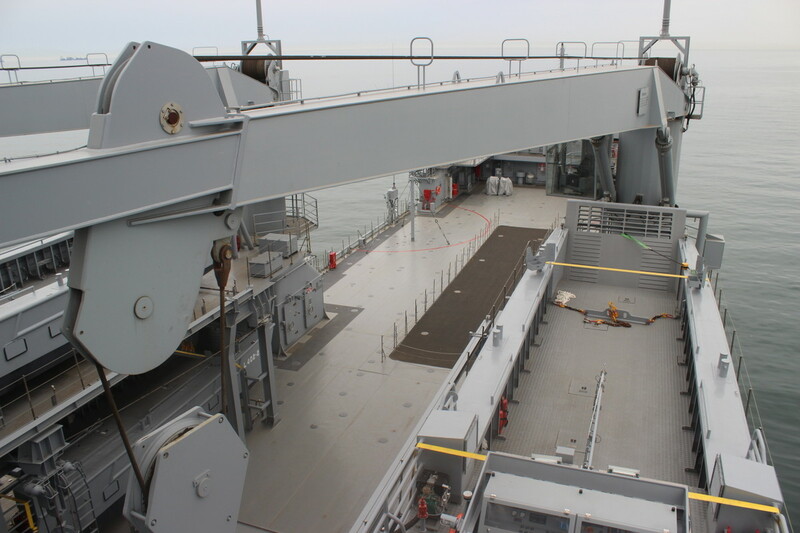 The photo was taken from aft looking to the bow door. 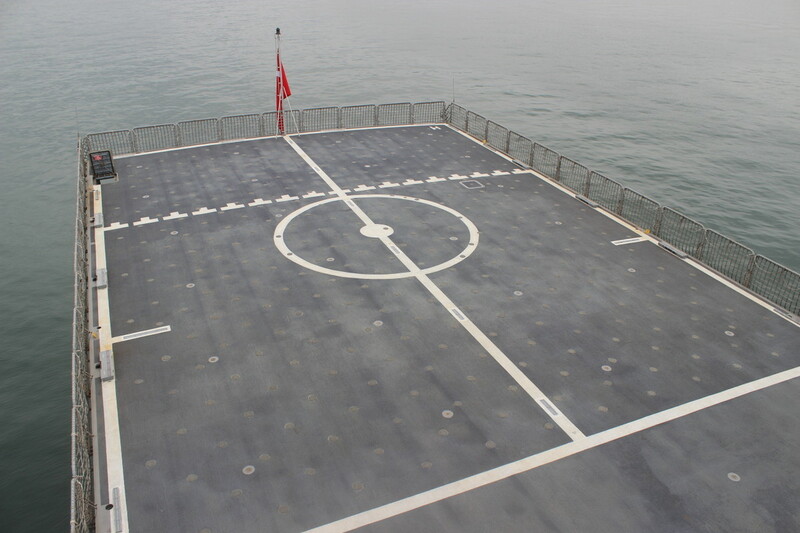 The deck is uncluttered and many hatches give an easy access to the deck. 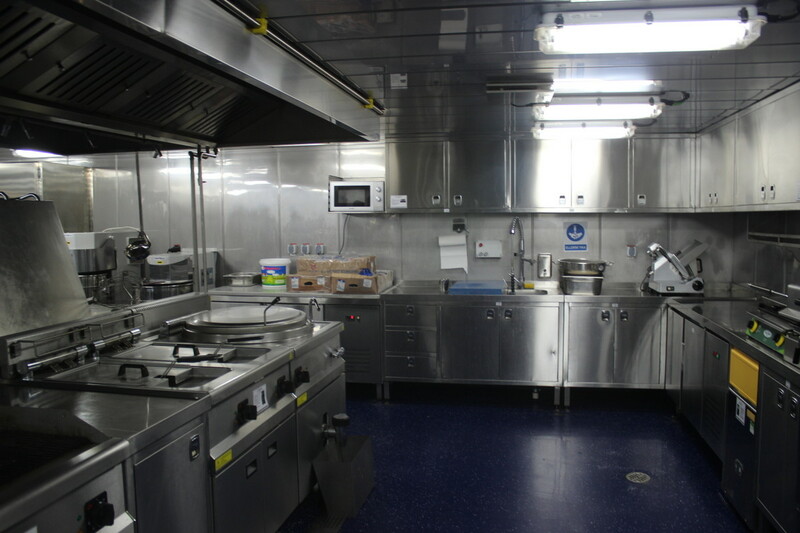 The galley. Since an army marches on its stomach this is one of the most important part of the ship. 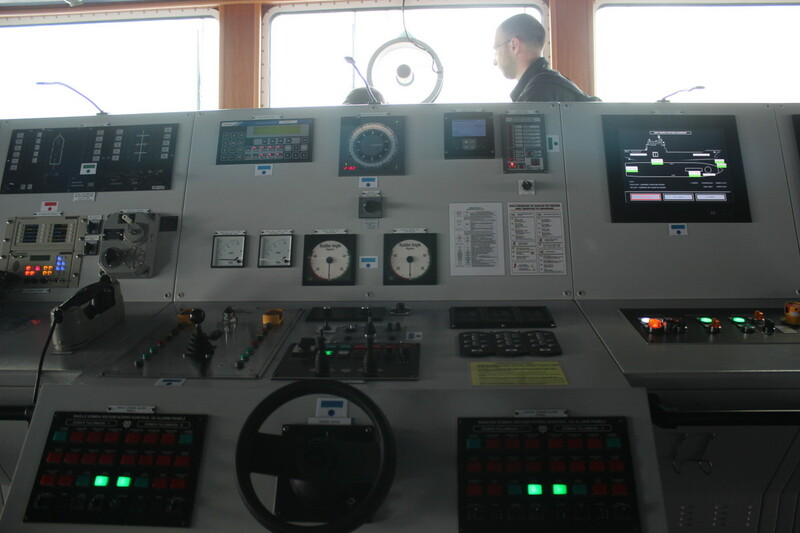 The helm at the bridge. Looking from bridge to the starboard crane and LCVP’s. The port side LCPV are part visible. There is ample place on the deck to park vehicles or store additional material. A close up view of the top starboard LCVP. TCG Bayraktar carries 4 of them. The black surface on the deck must be the ramp to the lower decks. A close up to the counter measures on board. The Ultra Sea Sentor launcher is in foreground. The Sea Sentor suit has a passive array to detect submarines, a command and control module and this counter measure launcher. A locally made chaff and flare launcher -similar to Mk36 – can be seen on the background. The black thing in the middle of the image is, one of laser warning receivers. 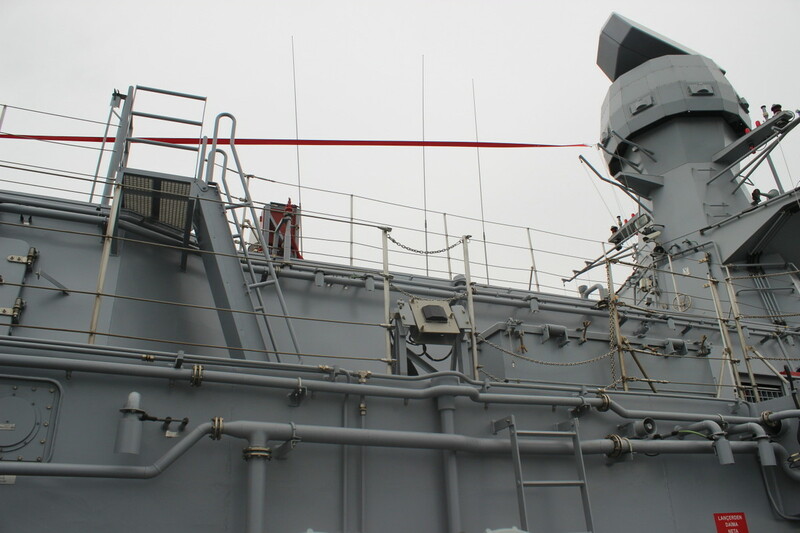 On the right the main mast of the ship can be seen with the ARES 2N ECM antennas and a SMART-S MK2 3D radar on top. The shape of the mast and antenna arrangement is the same of Ada class corvettes. A commercial of the shelf navigation and helicopter approach radar looking to the aft of the ship. The pipes and sprinklers of the wash down system are visible. They help to clean away the contamination in case of a NBC warfare and to cool the ship so she is less visible to heat seeking sensors. TCG Burgazada (left) is in dry dock and being fitted out. TCG Kınalıada (right) is still on the slipway. Her shape indicates all major constructing is almost finished. She seems to be almost ready for launching in September. There are some interesting steel blocks lying just to the left of the slipway. They can’t be made for TCG Kınalıada since her shape is full and there is no room to add these blocks. Thus they must the first blocks of TCG İstanbul. They will be placed on the slipway once TCG Kınalıada is launched. The fitting out of the third Ada class (Milgem) corvette TCG Burgazada is proceeding on the dry dock. The fabrication of the hull of the fourth and final Ada class corvette TCG Kınalıada is almost finished. 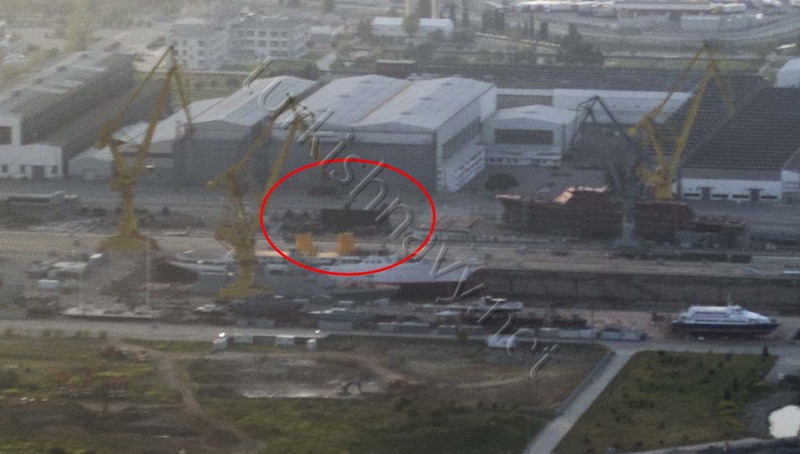 The pre-fabrication of the first İ class frigate is continuing. First two blocks of the hull is ready to be placed on the slipway once the last Ada class corvette is launched. In November 2016, Dutch shipyard Damen has signed a contract with the International Organisation for Migration (IOM) in Ankara, Turkey for the supply of six, search and rescue (SAR) vessels for delivery in 2017. The boats are designed for SAR operations in all-weather and can self right within seconds after a capsize or even a 360° roll. The 19 meter long boat, has a maximum speed of 31 knots and can carry up to 120 survivors. The six boats will be built by Damen’s Turkish Shipyard in Antalya. The first two boats are scheduled for delivery in the first half of 2017 and the deliveries will be finished by the end of 2017. These will be the first Damen built boats for Turkish Coast Guard. And these boats are going to be the first dedicated and purpose designed search and rescue vessels of Turkish Coast Guard. Damen was not a supplier for Turkish Coast Guard. The fact that the contract was financed by EU funds must have helped the Dutch company. Turkish Coast Guard usually prefers local shipyards and local designs. Below is a video of the self righting test of the first boat courtesy of Mr. Murat Güçlü. A two months old photo of the ship taken during trials. 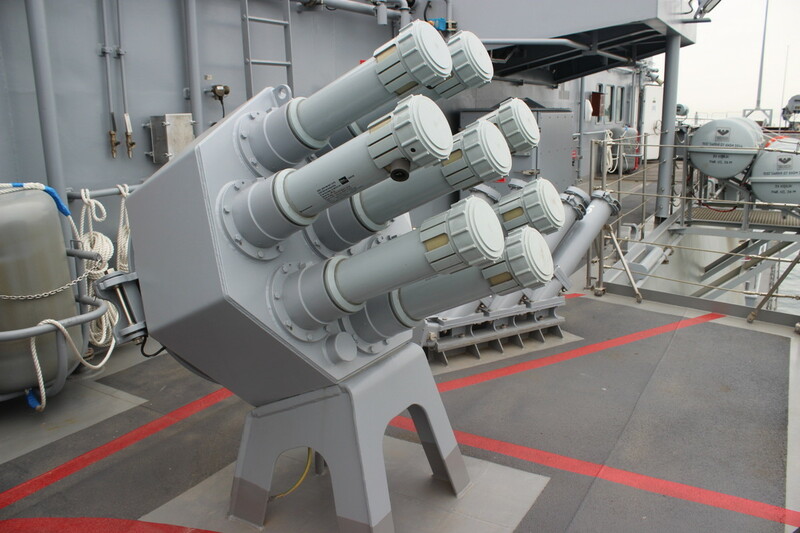 The lack of the CIWS are noteworthy. The orange thing on board is a floating target used for the gun trials. According to a tweet from Minister of National Defence the first ship of Bayraktar class landing ships L-402 TCG Bayraktar was commissioned in Turkish Navy on 14 April 2017. Since the ship will be under the shipyard’s warranty for 12 months, this is regarded as a temporary commissioning. A permanent commissioning is when Turkish Navy fully becomes responsible form the ship. The original weapon load of the ship was two 40 mm guns, two Mk-15 Phalanx CIWS and two 12,7 mm machine guns on stabilized platforms. When I saw the ship two months ago, the Mk-15 Phalanx CIWS systems were not fitted. The Mk-15’s are also missing in the current photos of the ship. It is highly possible that Turkish Navy will install the close-in weapon system itself since there should be around 10 in inventory. These weapons have been taken from old Knox class frigates as they were decommissioned. I wish TCG Bayraktar fair winds and following seas. 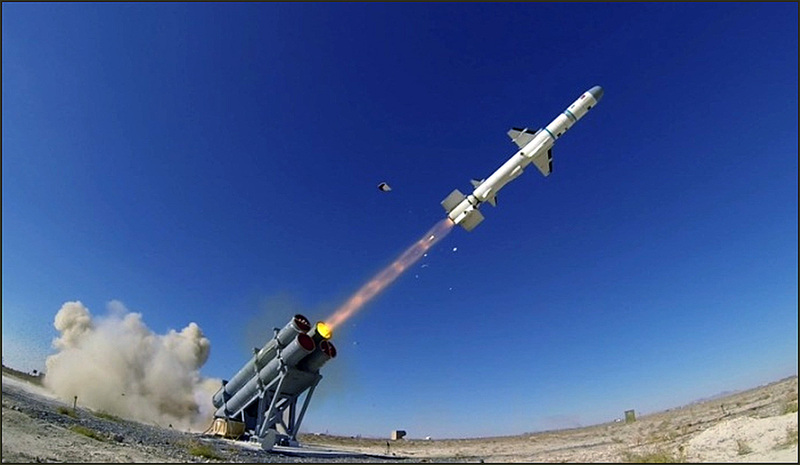 The above image is to be believed a photo of Atmaca anti ship missile. The photo was taken by a test firing on a terrestrial range. Probably to test the flight characteristics and or the range. The project must started at least 10 years ago. In his memorials Admiral Özden Örnek, Commander of Turkish Navy between 2003 and 2005, recalls that, he has been briefed by Roketsan that %85 of the current anti-ship missile in inventory, could be made by indigenous components. He approves the proposal and gives the deadline as 2015. There was very few publicly available information about the status of the project and the missile itself. Undersecreteriat For Defence industries (UDI) signed a contract for the R&D phase with Roketsan as main contractor, in 2009. The defense electronic company Aselsan is developing the RF seeker head and guidance section, Roketsan is responsible from the body and flight characteristics of the missile. In 2016 a test firing on a terrestrial shooting range was conducted. The above photo, published from this test is the first ever photo of the Atmaca surface to surface anti-ship missile. The photograph has strong barrel distortion as it was taken with a very wide-angle objective. The distortion makes it very difficult to judge the distances and the length of the objects correctly. The launcher mount and the 4 canisters mounted on have very strong resemblance to an Mk-141 Harpoon missile launcher. 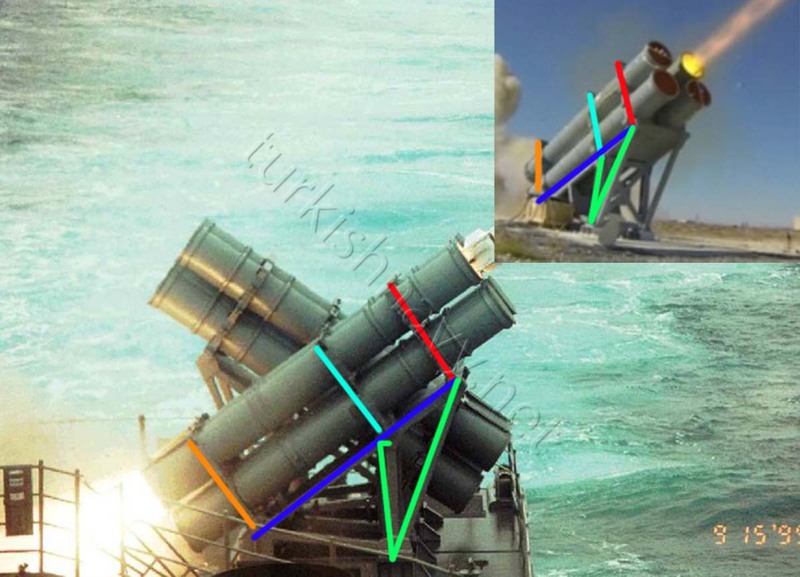 I have put a standard Mk-141 launcher and the Atmaca launcher of the same photo and marked some features. The similarities are just too much, to be just a coincidence. Thus I believe that Atmaca was fired from a Mk-141 Harpoon canister. And for the rest of the text I will base my assumptions on this fact. The longest version of surfaced launched Harpoon is Block 1D / RGM-84F. This missile is 5,23 or 5,28 meters long with the booster. It has a diameter of 0,343 meters and a wing span of 0,8 meters. Since Atmaca was fired from a standard Harpoon canister it cannot be longer than RGM-84F. Thus the length of Atmaca missile with the booster is less than or equal to 5,23 meters. The main wing of the Turkish missile is larger than its US counterpart. There are two hinges on the main wing of Atmaca compared to one on Harpoon wings. Therefore the wing span of Atmaca is greater than Harpoons. This change was obviously made to improve the flight performance of the missile. The control fins of the Turkish missile is considerably smaller than the US missile. The air intake of Atmaca is place between the wings and fins while the air intake of Harpoon is placed between the wings. According to Savunma ve Havacılık magazine a further test firing from a naval unit may happen in 2017 and according to the results of the test a low rate initial production (LRIP) may start in 2018. The initial production is estimated to be between 64 and 100 units. Atmaca missile is expected to be the main offensive weapon of the upcoming İstif class frigates. The ships with GENESIS combat management system are likely to be fitted with the new missile since the incorporation of the new hardware to existing the software will be less expensive and time consuming. 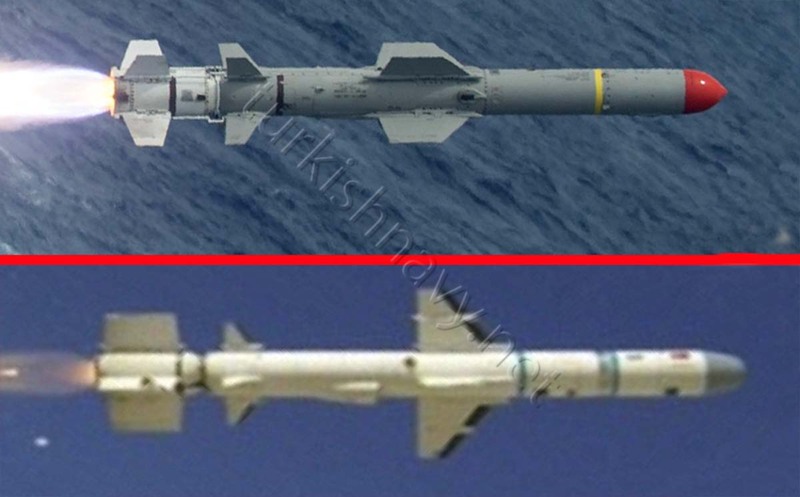 If Turkish Navy intents to exchange all the Harpoon missiles in its inventory on 1:1 basis with Atmaca missile the at least 350 missiles are needed. 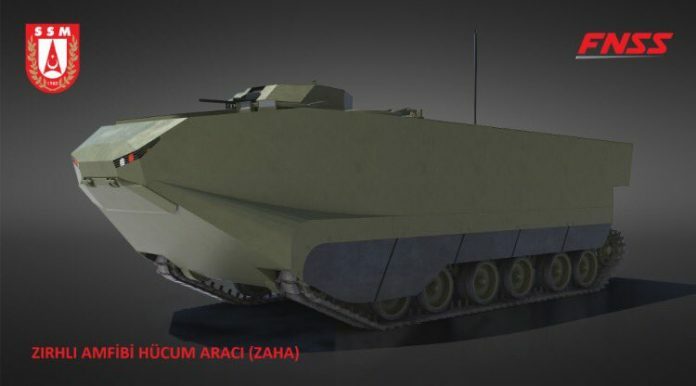 A digital rendering of the future Turkish AAAV by FNNS. On 7 March 2017, a contract was signed between defence acquisition agency Undersecreteriat For Defence industries (UDI) and FNSS a joint venture between Turkey’s Nurol Holding and BAE Systems, to design and build 27 armoured amphibious attack vehicles. These AAAV’s will be deployed on board of the future multipurpose amphibious assault ship TCG Anadolu. The break down of the order is 23 amphibious armored assault vehicles, 2 amphibious assault command vehicle and 2 amphibious assault rescue vehicles. Technical specifications of the AAAV’s has not been disclosed yet. But since BAE Systems, the manufacturer of the AAV7A1 of USMC, is part of FNSS, I would not be surprised if the Turkish AAAV’s have similar performance and appearance as their US cousins. 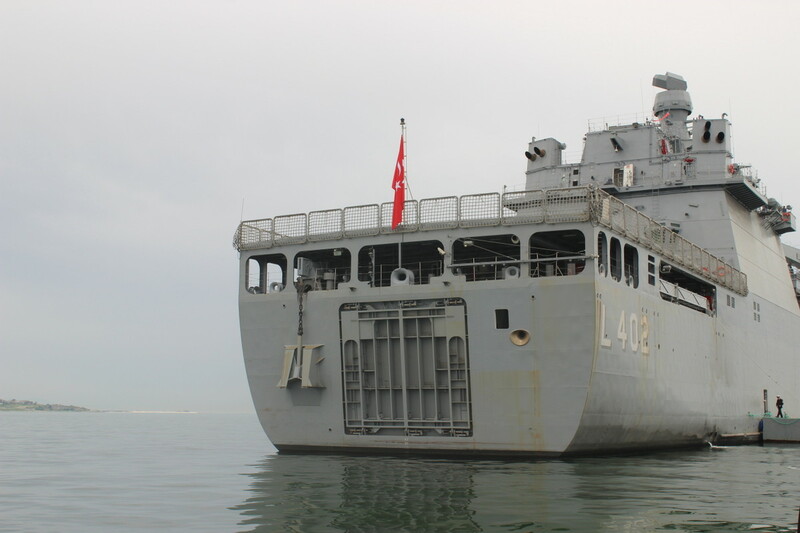 TCG Bayraktar on acceptance trials in Marmara Sea this weekend. Note her Phalanx CIWS have not been fitted yet. The first ship of the new landing ship class, TCG Bayraktar is undergoing sea trials and acceptance tests. The contract for the construction of a new LST’s was signed between Ministry of Defence and ADIK_Furtrans shipyard on 11 May 2011. The value of the contract is 370 million Euros. It took almost two years for the shipyard to find the 370 million Euro credit to cover the project as required by the contract. The first steel was cut on 14 May 2014 at ADİK Shipyard and was launched on 3rd October 2015. The shipyard has succeeded in keeping its contractual obligation and delivering the ship in 34 months. The second ship TCG Sancaktar is still under construction. The Bayraktar class ships have a crew of 129 and will carry 350 soldiers. The ships have a citadel to protect the crew from effects of nuclear, biological and chemical weapons. 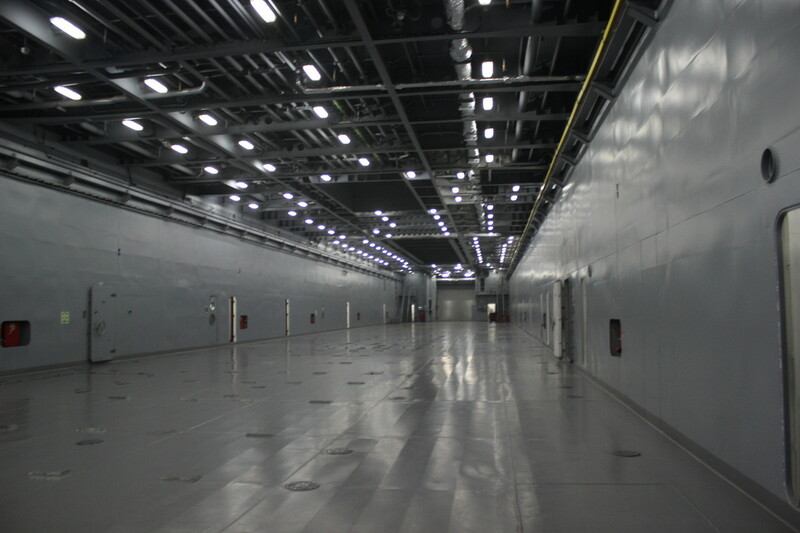 The closed parking area is 1100 square meters and the open deck parking area is 690 square meters enough for about 20 main battle tanks and between 24 – 60 vehicles. The armament consists of 2 single barreled 40mm Oto Melara guns, 2 Mk15 Phalanx CIWS, 2 machine guns on a stabilized remote-controlled chassis. 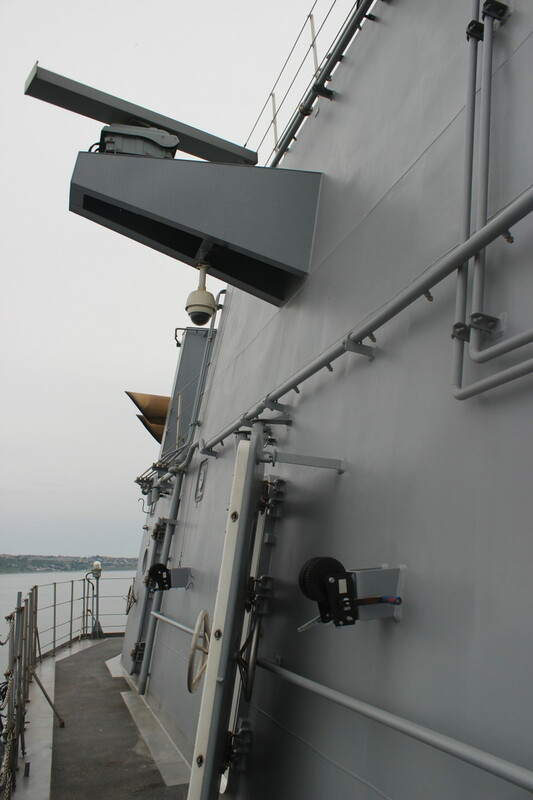 The ships have a Smart Mk2 3D air/surface search radar, which not common for an amphibious ship. Furthermore there are 2 AselFLIR 300D EO directors, torpedo counter measures systems, laser warning receiver and Link 16/22 system. All these sensors and weapons will be controlled by 5 consoles of GENESIS CMS. Today the new submarine rescue ship A-582 TCG Alemdar was finally commissioned into service. The ceremony was planned for an earlier date, but had to be postponed. 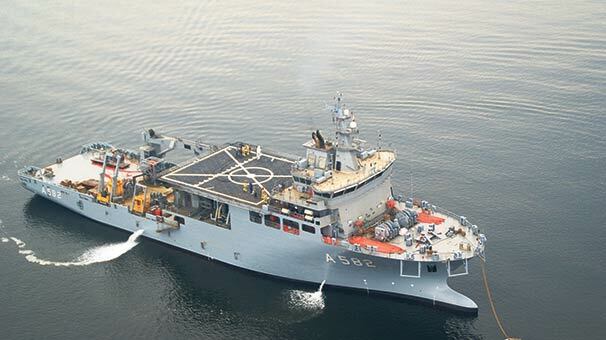 TCG Alemdar is the most capable submarine rescue vessel in Eastern Mediterranean and Black Sea region. systems. 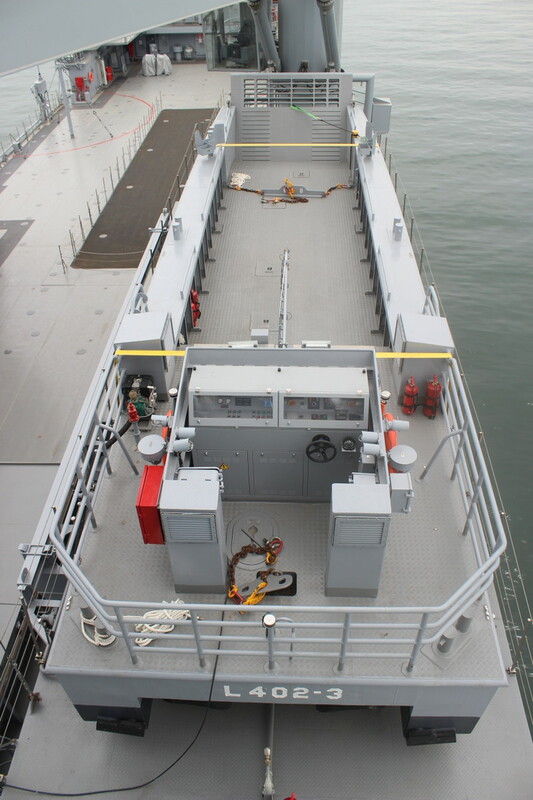 The built-in A-frame of TCG Alemdar will be able to support US Navy DSRVs. She is a most welcomed addition to Turkish Navy. 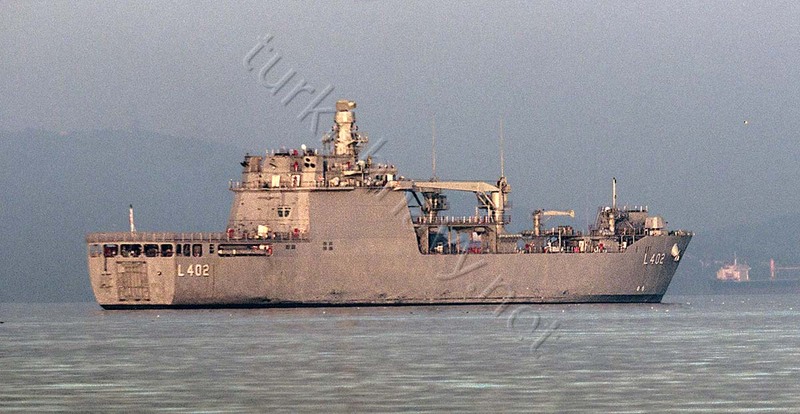 Auxiliary ships like TCG Alemdar may not have the appeal of a front line warships such as corvettes or frigates but these inglorious auxiliaries enable the other ships to function and save them when they are in a dire situation. 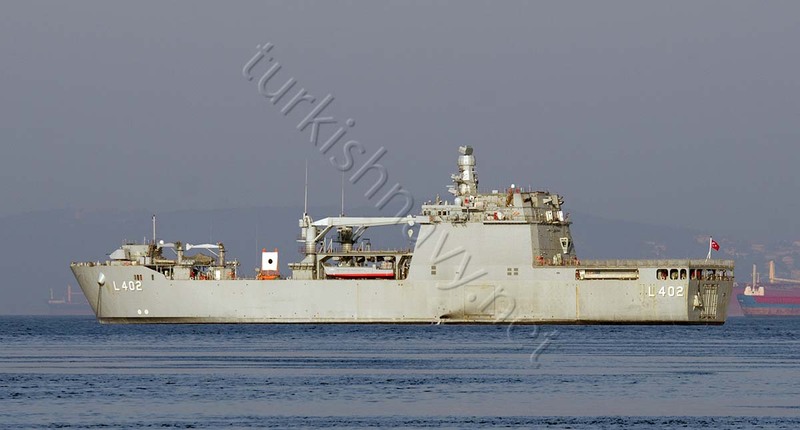 I wish TCG Alemdar calm seas and following winds.